A year later… « You know… that Blog? It’s been exactly a year since my last post, which I guess means that blogging just doesn’t hold the allure it once did. This past year has been the hardest of my life, beginning with a cancer diagnosis for my Mom on April 21st. 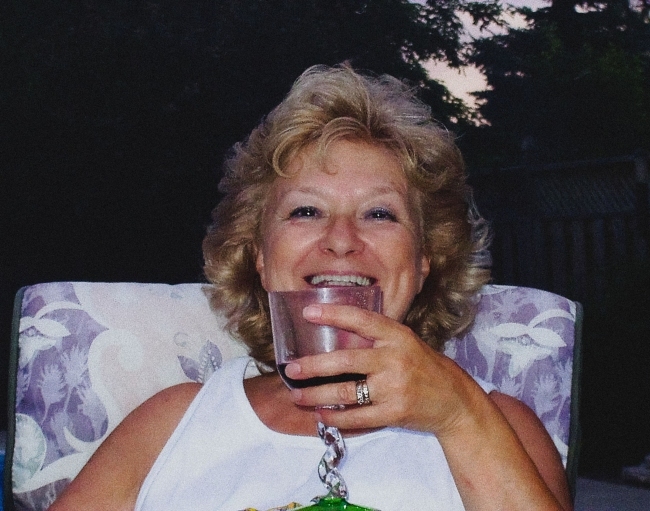 We hoped and fought so hard, but I lost my Mom a few weeks ago, on March 1st. My Mom died. She’s gone. I still don’t know how to process this. Every day is a crap shoot on if I’m going to get through it without sobbing. The grief is so absolute. I keep thinking, and I can’t stop. I think about the last time I saw her, and said goodbye. I invited her to haunt me (she hasn’t, so far). I told her we would be ok, and that we’re strong because of her, and how amazing she was to have as a mom. I keep thinking about how hard she tried to respond to me, the fading grip on my hand, the gut wrenching yet faint moan as she tried to tell me how much she loved me. I knew, and I told her so. I knew how much she loved me. Throughout my life, we always, always said so to each other. 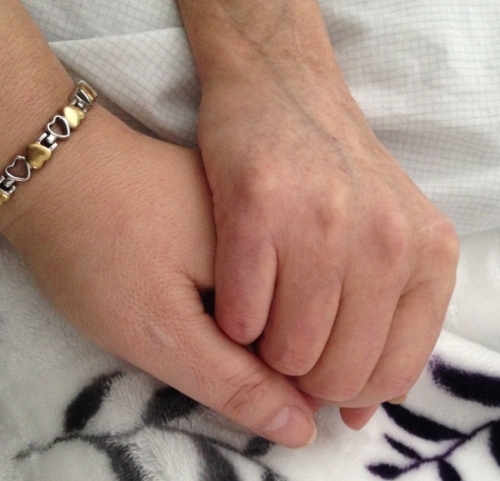 Throughout her illness, we talked, although it doesn’t seem like we said as much as was needed. As much as *I* needed to say. I know it never will, and I have regrets only that we didn’t have more time. I know it will get easier to bear. My friends who have been through it all tell me I need to just let the grief happen, and that it could take a year, or two, or more before the rawness subsides. I know this in my head. My heart will take longer. I can’t accept it, even though I know I have to. We had a party for her on April 3rd. In my family, we don’t believe in putting anyone through visitations and funerals. They’re horrible traditions and make things so much worse for the families left behind. We aren’t religious either, so there was none of that happening, and I’m grateful for it. In our family, we have parties. Call it what you will, be it an Irish Wake, or a Celebration of Life. We celebrate, because memories are all we have now, and sharing those is the best way to heal. The turnout was beyond what we expected, as people poured through the door throughout the afternoon. We laughed. There were a few tears, but so many more smiles, and that’s exactly what Mom wanted. She would have been pleased to see so many faces of those who loved her, and those who had never met her, but came in support of her family. It meant so much. I made bookmarks instead of memory cards – Mom was an avid reader, and she would have been tickled. My Dad really appreciated that, and said how appropriate it was. I see my mother in every Cardinal. They were her favourite of all the birds who frequented the feed stations or sat in the tree outside her kitchen window. I’ve always associated them with her, and even more so now. The day I went to pick up her ashes my SUV was dive-bombed by a Cardinal in an area that I’d never seen one before. I took that as a sign that Mom was there, and she was telling me that it was OK, because she was still here with me. Out loud, I said “Ok, Mom”. 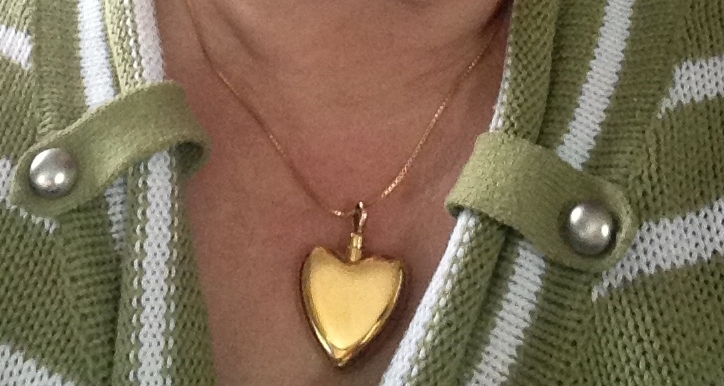 A week before she passed away, it suddenly became imperative that I find a large locket so I could keep some ashes in it. My friend Alice, who is a funeral director, talked me out of that, and found instead a pendant that was made especially for ashes. She ordered it and had it shipped to the funeral home (she lives an hour away) who would be taking care of Mom. My friend at that home, Rebecca, called me the next day to say that it was already there, and she’d take care of filling it for me. I thank both of my good friends with my whole heart for helping me with this. Having a bit of Mom has been extremely comforting for me. The Hubby and kids have been wonderful, and understanding when I’m not as present as I need to be. I hurt my back lifting my Mom when I was caring for her, and it’s taking a while to heal. The grief and stress has exacerbated my Fibromyalgia, and the elevated pain I’ve been suffering with is my body is telling me I’ve got to start taking care of myself. I know, and I owe it to my kids and hubby to do that. I will. I am. My Dad is a rock, and while I’ve only seen him break down twice in this whole ordeal, I know how much losing Mom has devastated him. He lived for my mother, and everything he ever did was with her in mind. I’ve been so worried about him in all of this, and between my brother and me, we’ve tried to minimize the amount of time that he’s alone. I know he needs to be alone though, in order to learn how, and also privately grieve as he needs to. A couple of times I’ve dropped everything because he’s called to ask if I was free to spend the day with him – he won’t say he needs anyone, but when he asks to spend time with you, you know he really needs it. He’s going to be ok. He’s making plans for his future, and that is a huge relief for me. He’s retired, but he’s not an old man, and he knows he has to keep going. We all do. And we all will. A lot more has happened in my life in this past year, but this post is about my Mom, and I’ll catch everything else up another time. Or maybe I won’t. I’m not putting pressure on myself either way, so what will be, will be. Thank you for sharing this with me, friends. Writing about it was damn hard, but I needed to do it. I love you, Mom. Haunt me or fly by any time… I’m waiting for you.